The Cartier Ruby and Diamond Necklace was a gift from Mike Todd, Elizabeth’s third husband. 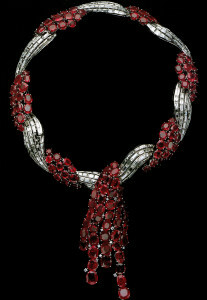 The necklace featured seven oval rubies with round and baguette diamonds forming a lattice framework and finished with a ruby and diamond clasp. 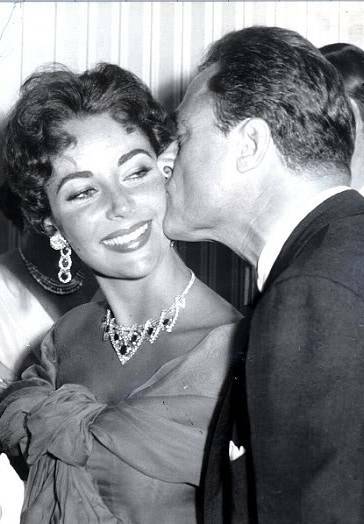 In August 1957, while Mike Todd and Elizabeth were on vacation near Monte Carlo, they were swimming in the pool and relaxing and he suddenly surprised her with the stunning necklace. 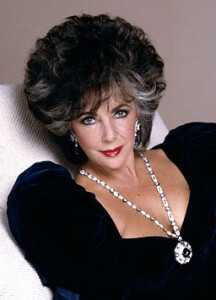 Being Elizabeth, she quickly put on the necklace, along with the matching bracelet and earrings, and then returned to swimming wearing all the jewels! 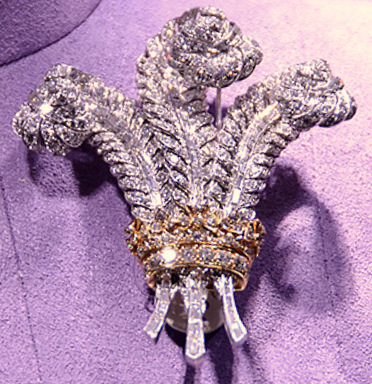 On the occasion of their engagement, Richard Burton gifted Elizabeth with the Bulgari Brooch. 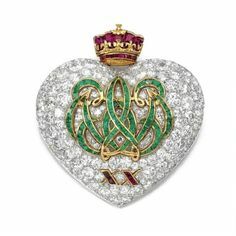 The brooch features an 18 carat rectangular-cut emerald surrounded by pear-shaped diamonds set in platinum. 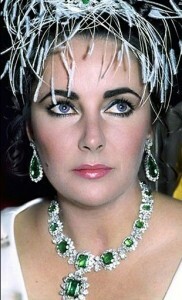 Elizabeth wore the emerald brooch on March 15, 1964 when she and Burton were married the first time. 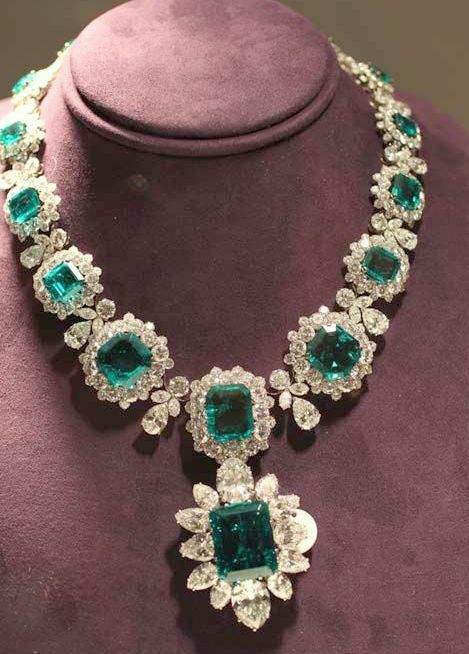 The emerald and diamond necklace features sixteen graduated rectangular-cut emeralds surrounded by round diamond clusters and in between are pear-shaped and round diamonds forming a quatrefoil shape and the entire necklace is set in platinum. 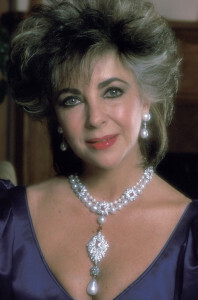 Later, Elizabeth would frequently attach the brooch to the necklace as a pendant. 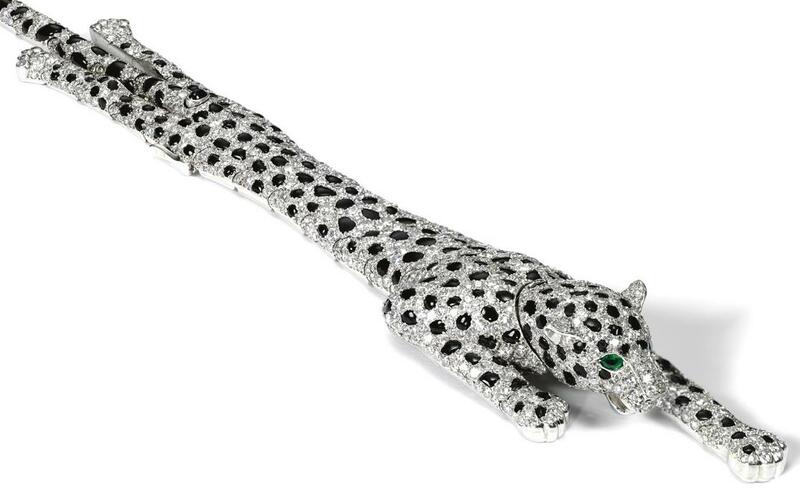 The “Night of the Iguana” Brooch by Jean Schulumberger of Tiffany & Co. was purchased in 1964 by Richard Burton. The reason for the name is that Elizabeth accompanied Burton to Puerto Vallarta, Mexico while he was filming the John Huston movie, “Night of the Iguana”. The couple had such a fabulous time that to commemorate the film’s premiere Burton gave her the brooch as a special gift (hence the name!) The design of the brooch is actually a dolphin with diamond and gold scales, the head features cabochon sapphire eye and an emerald mouth all set in platinum and gold. 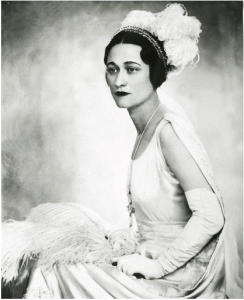 The large 33.19 carat diamond was previously owned by Vera Krupp, her family were German industrialists. 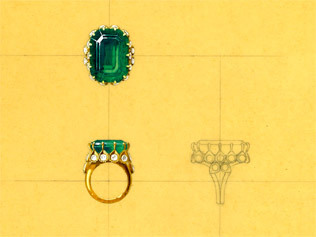 The type IIa-rated diamond (the most pure and flawless grade of diamonds) is cut in a deep emerald-style, sometimes referred to as an Asscher-cut indicating a style frequently cut prior to the 1920s. 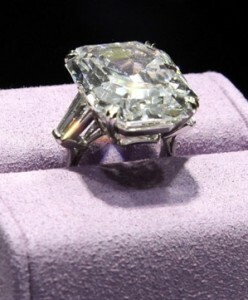 When the diamond came up for auction by the Krupp estate in 1968 Burton paid a reported $305,000. 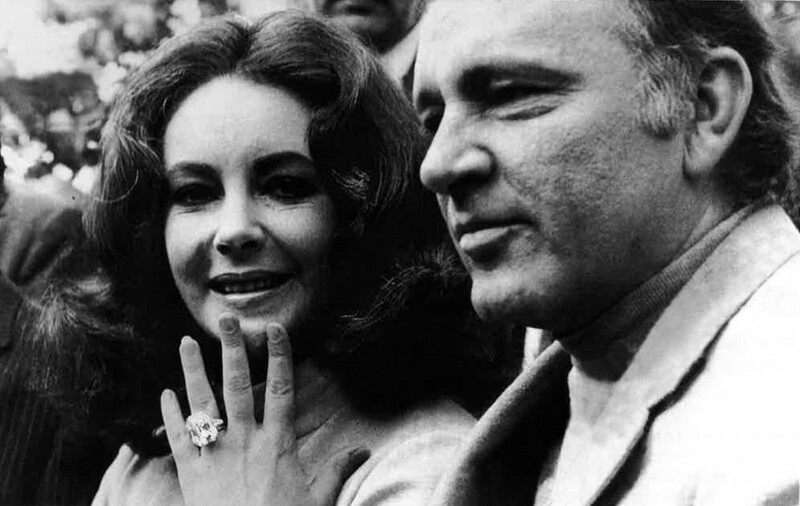 Elizabeth wore the Krupp Diamond ring frequently referring to it as her favorite piece of jewelry. 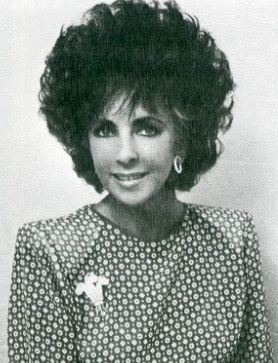 After Elizabeth’s death, the Krupp diamond was sold at auction for over $8 million and it has since been renamed the “Elizabeth Taylor Diamond”. The original rough 241 carat diamond was found in a South African mine in 1966. Harry Winston bought the rough diamond and had it cut into a 69.42 carat pear shape and set into a platinum ring with two smaller diamonds on either side for Mrs. Harriet Ames, the sister of Walter Annenberg. She sold the diamond ring in 1969 to Cartier Jewelers and the diamond was remained the “Cartier Diamond”. 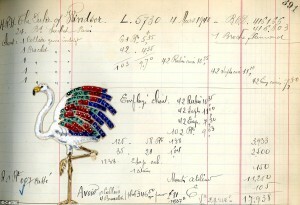 Subsequently Cartier put it up for auction and it was bought for over $1 million by Richard Burton in 1969. Elizabeth felt the ring was too heavy and had it redesigned into a necklace, she commissioned Cartier to create an $80,000 diamond necklace made of several graduated pear-shaped diamonds as a setting for the larger diamond now hung as a pendant. 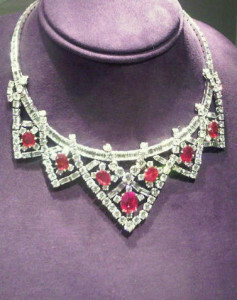 Elizabeth wore the newly designed necklace for the first time at Princess Grace of Monaco’s fortieth birthday party held in Monte Carlo and then later to the Academy Awards in 1970. After her second divorce from Burton in 1978 (yes, Elizabeth married him twice!) 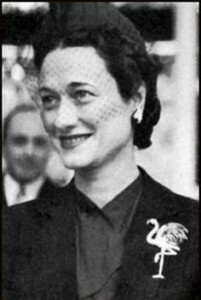 she sold the diamond to Henry Lambert, a New York jewelry and it was subsequently sold in December 1979 to Robert Mouawad of Mouawad jewelers and it is now known as the “Taylor-Burton” necklace. 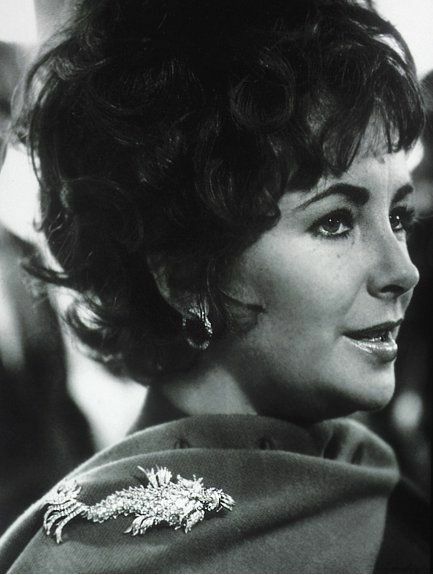 The La Peregrina Pearl has a long history. 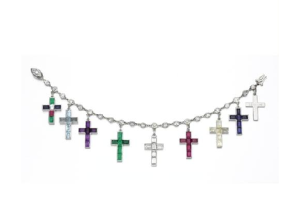 It was first discovered in the Gulf of Mexico and presented to the King Phillip II of Spain who in turn offered it as a wedding present when Mary Queen of Scots married. After her death, the pearl was returned to Spain, many of the Queens of Spain can be seen wearing the La Peregrina Pearl in their official portraits. Later, the pearl became the procession of the Bonaparte family of France but by the end of the 19th century there is no documentation to show what happened to the La Peregrina Pearl. A century later, the La Peregrina Pearl was purchased from the Parke-Bernet Gallery in New York City by Richard Burton in 1969 for $37,000. 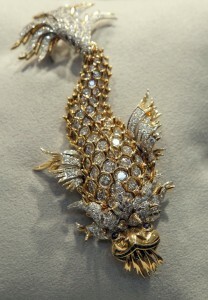 The pearl was on a gold chain but this was too simple for the taste of Elizabeth. 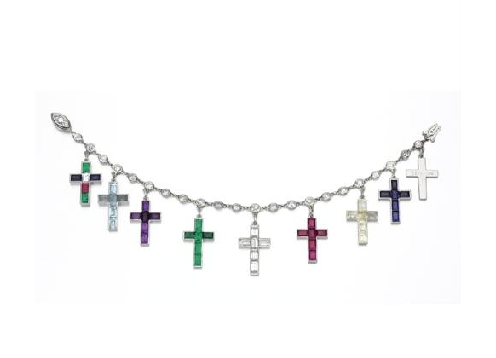 She commissioned Cartier to create a more elaborate necklace inspired by a portrait she had seen of Mary Queen of Scots wearing the La Peregrina Pearl. Elizabeth collaborated with Al Durante of Cartier and they designed a necklace featuring two rows of pearls, twenty-three larger pearls and thirty-four larger pearls, intersected with eight separate clusters of diamonds centered by a cushion-cut ruby style to resemble flames all set in platinum and gold. In the center of the necklace is the La Peregrina Pearl hangs from a diamond and silver bail which is attached to a large cluster of diamonds centered by a pear-shaped ruby which is attached to a large pearl and then another pear-shaped ruby and then finally attached to the necklace. 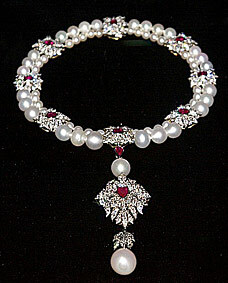 The La Pergrina Pearl Pendant can also be detached and worn as a brooch. After Elizabeth’s death, the La Peregrina Pearl Necklace sold for over $11 million at the Christie’s auction. 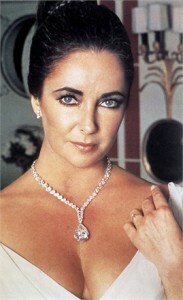 Throughout their marriage Burton bought several Bulgari pieces of jewelry and in 1969 he gave Elizabeth a diamond and sapphire sautoir. 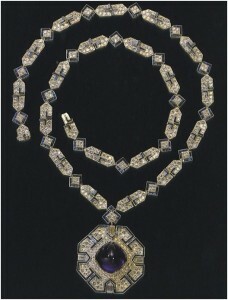 (a sautoir is a long necklace set with precious stones usually with a hanging pendant that can be worn either shortened or full length) The necklace is a chain of pave-set diamonds and calibre-cut sapphire geometric-shaped links all set in platinum with a large pave-set diamond octagonal-shaped pendant with more caliber-cut sapphires and pave-set diamonds with a 50 carat cabochon sapphire in the center also set in platinum. 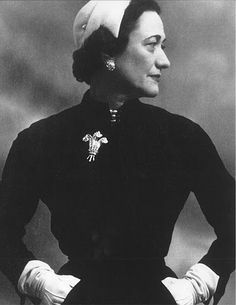 The pendant with the large sapphire can be detached from the necklace and worn separately as a brooch. Richard gave her the Taj Mahal Diamond with a Cartier Gold and Ruby Chain to Elizabeth in 1972 on the occasion of her 40th birthday. 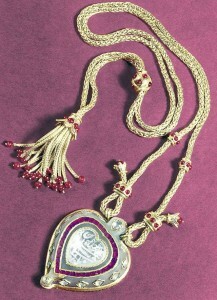 The large engraved heart shaped diamond is surrounded by a red stone and jade mount which is hung from a woven gold chain embellished with cabochon rubies. 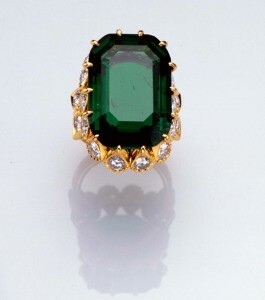 This unique piece of jewelry has a very interesting past and dates back to the 1600s. 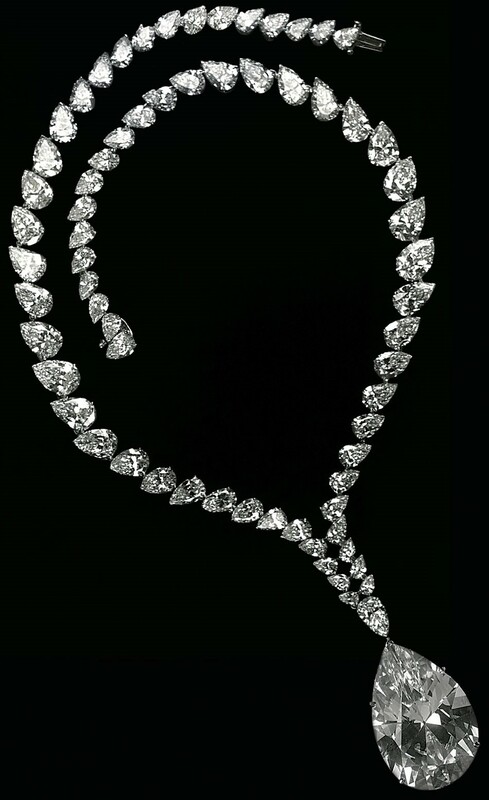 The engraving on the diamond reads: Nur Jahan Baygume Padshah, 23 and 1037. 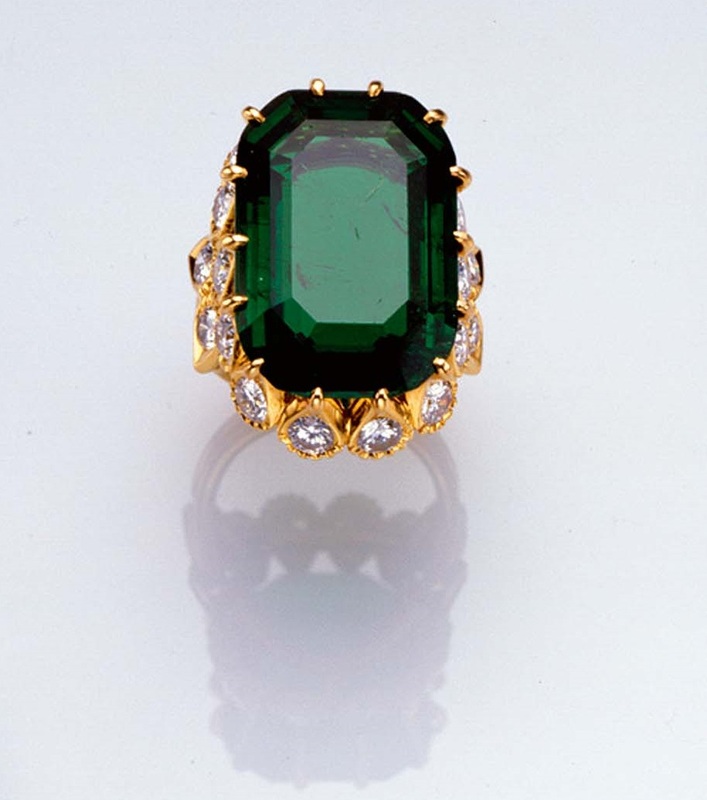 It means that Nur Jahan was the favored wife of Padshah and 23 refers to the year of the Shah Jahangir reign and 1037 which translates to the date 1627 A.D. Later the pendant was given to the Shah’s son, Prince Khurram, who later became Mughal Emperor Shah Jahan after the death of his father. He in turn presented the pendant as a gift to his most beloved wife, Mumtaz-I-Mahal but she unfortunately died in 1631. 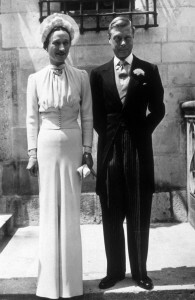 The Shah was so overcome with grief that he commissioned a large ornate mausoleum in her honor and it became known as the famous Taj Mahal located in India. 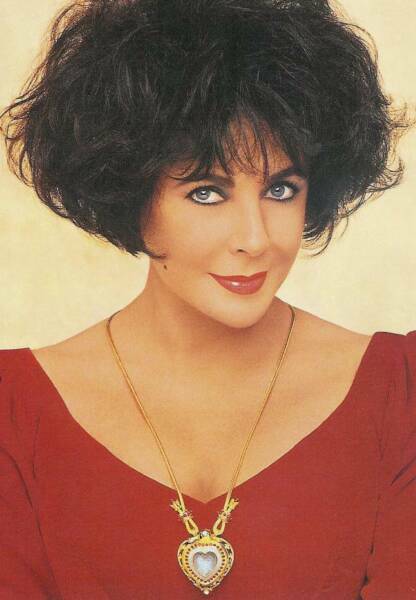 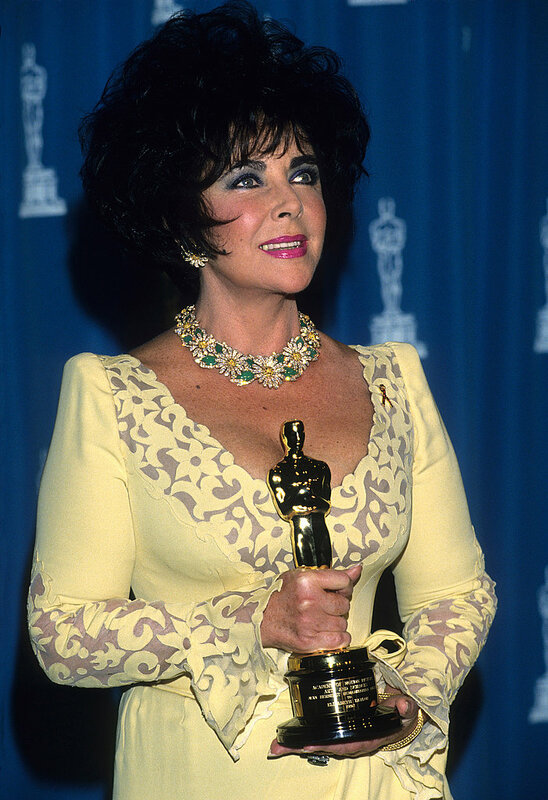 In 2011, at the auction of Elizabeth Taylor’s jewelry collection, the Taj Mahal Diamond Pendant and Cartier Gold and Ruby Chain sold for $8,818,500. 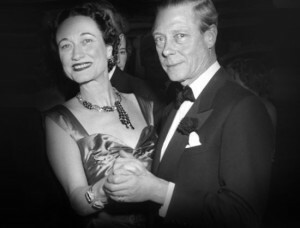 Elizabeth and Richard Burton were friends of the Duke and Duchess of Windsor and often visited them when they were in France. 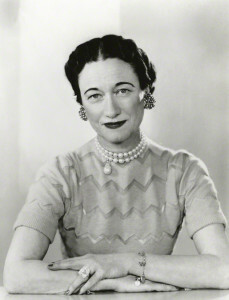 The Duke had formerly been the Prince of Wales before he briefly became King Edward VIII but then abdicated the throne in 1936 for the “women that he loved, Wallis Simpson. The “Prince of Wales” Brooch was commissioned by Edward especially for Wallis. 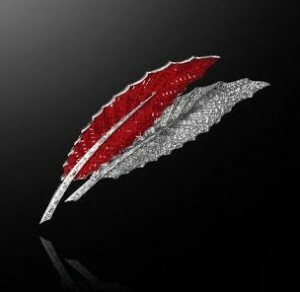 The brooch design depicts the symbol of the Prince of Wales with three pave-set diamond feathers accented with baguette-cut diamonds which are gathered together by a crown, the piece is set in platinum and 18k gold. 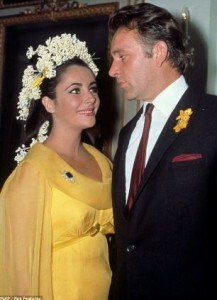 Although Elizabeth was born in a suburb of London, England, Richard Burton was born in Wales. 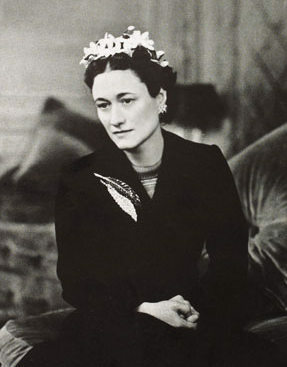 Maybe given this fact or perhaps because she felt that their love story was so similar to that of the Duke and Duchess of Windsor, every time she would visit them she would always tell the Duchess how much she like her Prince of Wales Brooch. 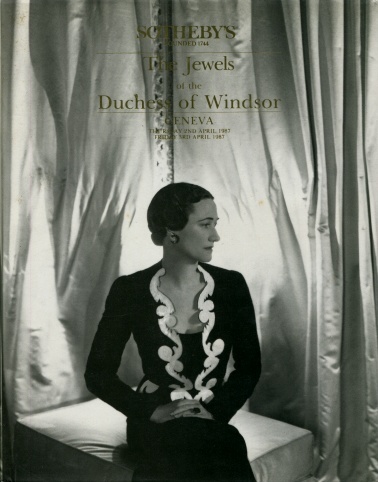 Then, in 1987 after the death of the Duchess her jewelry collection was auctioned by Sotheby with the proceeds going to the Pasteur Institute which was a leader in AIDS research. 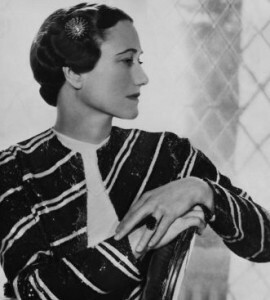 Elizabeth knew she had to bid on the brooch and money was no object. 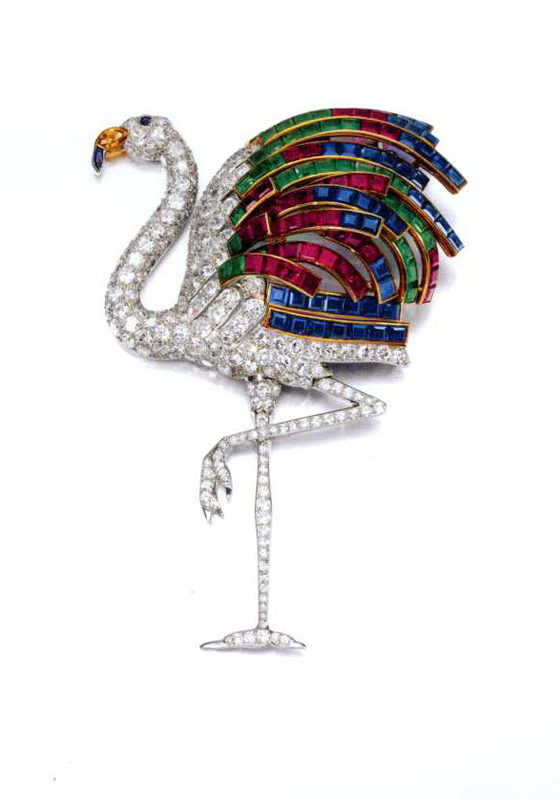 Ultimately, Elizabeth’s final bid was the highest (over $623,000) and she got the brooch, the first piece of jewelry she had ever bought for herself! 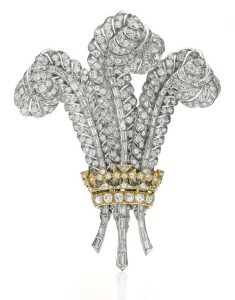 After Elizabeth’s death, the Prince of Wales Brooch sold for $1,314,500 at the Christie’s auction. 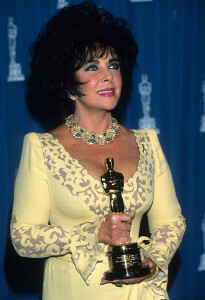 In preparation for receiving the Jean Hersholt Humanitarian at the Academy Awards in 1993, Elizabeth borrowed a stunning Van Cleef & Arpels daisy necklace and earrings to wear with her beautiful yellow Valentino dress. 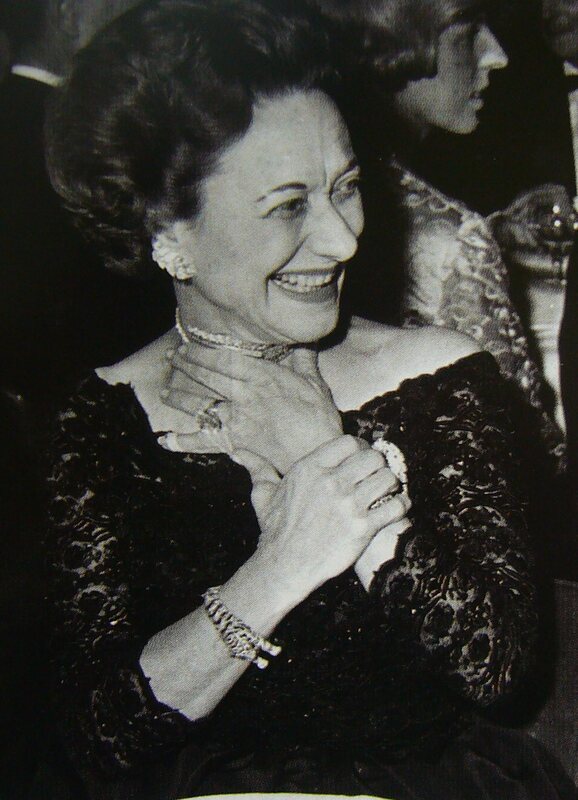 She loved the necklace and earring set so much that she later purchased it as her good luck charm. 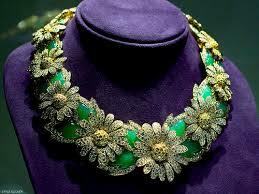 The necklace was a series of graduated pave-set diamond daises each accented with a round yellow in the center, the daises were joined together by caliber-cut chrysoprase leaves accented with more diamonds which were all set in 18k gold. The daisy earrings complimented the necklace perfectly and Elizabeth also purchased the matching brooch.